Still let us specify that what the owner calls “PV surmounted of a lion” - punch of Liège which could not be only on the weapon - is in fact a punch PV surmounted of a crown with 3 branches and without bar of separation, which is indeed the “ponçon Polvera Viva” of use in Spain. In gauge .320, these revolvers are with 6 blows with blasting powder; because of the sharp powder and not to have too much to change with dimensions nor with the quality of steel used, one dug only 5 rooms in the barrels into 8 Lebel, so that the walls are thicker. 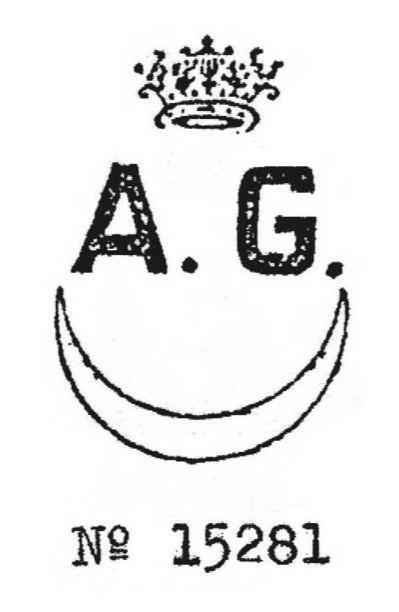 I find for my part the punch AG in a crowned oval and the initial crowned AE a little too close to our punch ELG* and crowned logo AF of the friend Auguste, not you? With the origin, barrel and cylinder are blue, the marbled carcass, heads of screw, trigger and console of extractor turned blue with the flame, rod of extractor white polished.